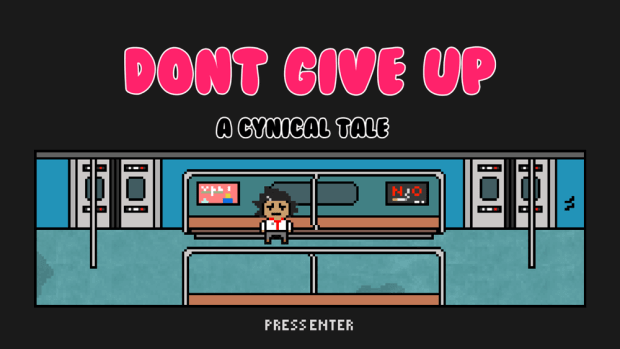 Over the summer I had the privilege of taking a crack at the live demo for DON’T GIVE UP, with Taco Pizza Cat’s developer Tris Bee standing close, explaining parts of the game to a fellow gamer. It was at a pseudo monthly indie developer meetup in Portland OR called PIGSQUAD (short for Portland Indie Gamer Squad), and DON’T GIVE UP stood out as having its own uniqueness to it. It is, of course, a top-down RPG, but something about it just has that “it” factor. I was instantly attracted to the character concepts and unique battle system, and the music had its own character and appeal. The writing is miles above what you see in a lot of other indie games (or even AAA games?? ), especially involved with teams of one or 2 people. It is a wonderful game. And, to be transparent, I backed the kickstarter instantly when it went up. The folks making this game are trying to raise $5000 to make something really awesome. Currently, the game is in demo form, and you can play and download it! They are about 80% funded as I write this feature, so go go go and donate! Your card doesn’t even get charged until the end of the campaign, so even if you don’t get paid for a bit, make a donation and help spread the word! The more these crowdfunding projects make, the better they do, and the healthier their devs are, so even if they make it to %100 funded, pre order the game! It is going to be amazing! The GRAPHICS: The graphics in the demo are a really wonderful mix between pixelated and hand-drawn. The characters, the buildings, everything in the world feels very real despite the cartoony look of the sprites. Everyone has a place they go, and there is a wonderful cast of characters that go far beyond just a sprite swap on the same template of a character. This is also one of those games where the mood of the sprite work aligns perfectly with that of the writing and dialogue. 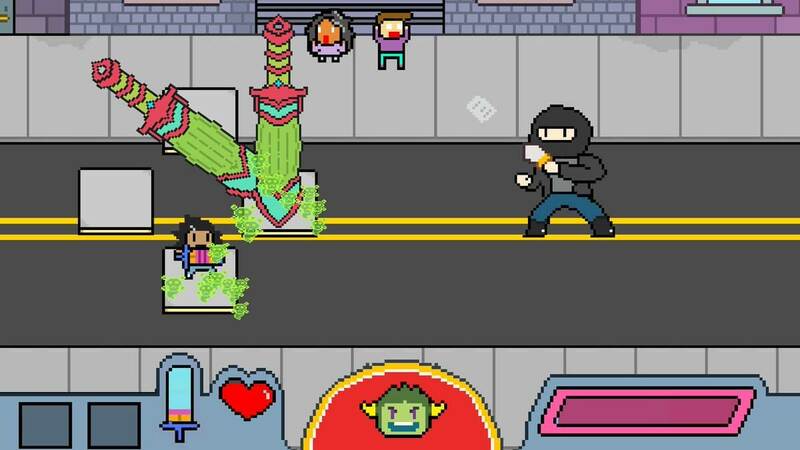 The MECHANICS: DON’T GIVE UP has a wonderful take on the RPG battle system, where you switch up between two different “phases”. One phase has you pressing arrows on the d-pad to evade attacks by your opponent, until they tire out. Then, the next phase lets you send a barrage of powerful blows in their direction, including some rad Street Fighter-esque combo patterns! This style keeps all the battles fresh, I imagine even if later in the game you came across a longer one, it would still be super fun and interesting because you don’t get stuck in the same pattern of picking the same (most powerful) attack over and over again. The MUSIC: Chiptunes at its finest! The tracks on this OST range from soaring, to cute, to doomy, to pretty much everything in between. These songs really keep the action moving as well as keeping you locked into the motives and emotions of each character! The WRITING: As I said before, the writing is great! I can’t really explain too much on here without giving it away, but I really enjoyed playing this demo! I am very excited to see this story, and all of its individual parts, get more and more fleshed out once the game gets totally funded. It’s a story about depression with hope! It is a hopeful story where everything goes wrong! DON’T GIVE UP totally finds the right balance in its plot and I can’t wait to see more. All in all, DON’T GIVE UP has an amazing amount of polish, and the mood is great, which in my opinion are the two most important factors of a game trying to stand out in the indie dev world. It must be your priority to pick up the demo, give it a play through, and then back the kickstarter, which you can find here!